The first time I made this it was kind of on a whim. I had ground beef. I had rice. AND I actually had green onions. I was also running short on time. I am glad I occasionally give into whims. This meal comes together so, so, SO easily. The dish was so tasty. Consequently, there were absolutely no leftovers. I also made it again within a week. Second time, again, no left overs. The whole family loved it and ate it with no complaints. Two thumbs up...some of you know my children are not above giving me thumbs down! Little boogers. Anyway, back to the "two thumbs up". They loved it. Give it a go. You won't be disappointed. Heat a skillet over medium high heat. Cook the ground hamburger in the sesame oil until completely cooked. Add in the garlic and cook for another couple minutes, making sure not to let the garlic burn. Drain of the fat if there is any. Add in the brown sugar, soy sauce, ginger, Sriracha, and salt and pepper. Bring to a simmer and let it cook for about 5-7 minutes, stirring frequently. 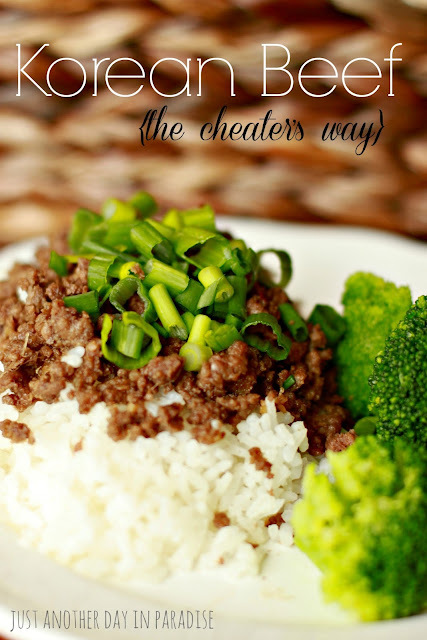 Serve the beef over steamed rice and topped with A LOT of green onions. Is that 1/2 teaspoon of minced ginger? I'd love to try this recipe. Oh....this sounds so easy and yummy. Thanks Rissa! You are the best.